Maybe you're moving to a new home and you won't need some of your old appliances. Perhaps you've made the leap to upgrade and buy all new units for your kitchen or laundry room. Or possibly you've simply decided to downsize your lifestyle and have to get rid of some of your appliances. No matter the reason, the common denominator is that you have to find a practical and - hopefully - easy way to get rid of your working appliances. The good news is that you have several great options disposing of your unneeded or unwanted appliances. However, there are two major categories of appliances that have their own disposal methods to consider. Typically, these appliances cannot be sold or donated. And, since they no longer have value to you, the only real option is to get them to your local landfill, if they qualify for special recycling requirements. Otherwise, they will have to be dumped or possibly sold for scrap. If simply removing an appliance is all you need, there are professional firms that will pick up your used appliances and then recycle them. Outsourcing this task benefits you by eliminating the tasks of lifting, hauling, and dumping the appliance, not to mention the disposal fees you might otherwise have to pay at your community landfill. Let's say you have some appliances that have been used for a few years, but are still in good working order. Do you simply send them off to the dump? Not at all! In fact, there is a thriving market for used, working kitchen and laundry appliances. These used, but still workable appliances can have huge value. So, one option is to sell your old items. How best to do that? One obvious approach is to offer them in a garage or yard sale. If it helps, you can partner with some neighbors and conduct a joint sale that includes your old stove or dryer. However, you shouldn't expect to get anything near the original value or even close to half price for an appliance. This is because, even if your old appliance was never even used, most people will expect bargain basement prices for used equipment. So it's probably best to keep your price reasonably low. 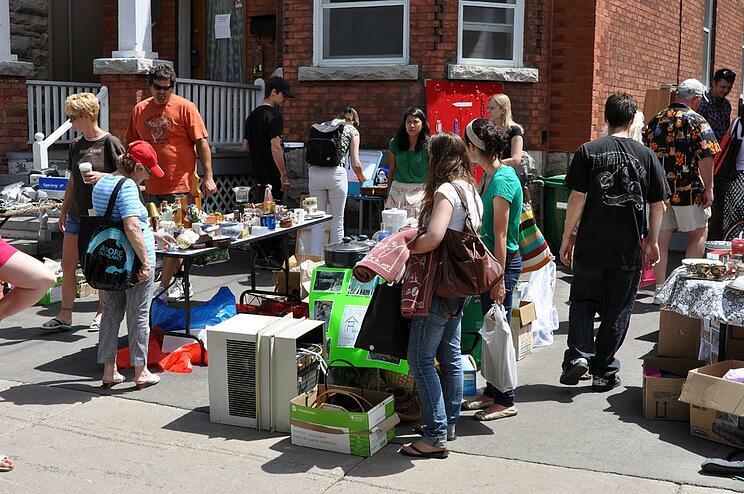 Maybe a yard or garage sale is not feasible, or something you care to do. No worries! There are used appliance outlets, church or community thrift stores and other used item shops that will be happy to take them for a fee. It may not be much, but it can cover the cost of your trouble and put a few dollars in your pocket. However, a really great option is donating your old, but working, appliances. It's incredibly easy and many organizations will also pick them up for you, saving you the trouble of loading, hauling, and unloading your old washing machine or dishwasher. The benefits of donating work both ways. Donating allows you to not only get rid of your old appliances in an almost painless fashion, but will also give you the great feeling of having done good for others. In addition, you can almost always use that donation as a tax write-off. The other benefit is the value you can provide to someone else in need. Most appliances are considered basic essentials in our society. Imagine not having a stove or a washing machine? Not to mention a working refrigerator! Your donated appliances can find their way into a new home serving a much-needed function for someone less fortunate than yourself. There are even options in terms of how you can donate your used appliance. For many, the obvious choice would be some organization such as Goodwill or The Salvation Army. While these, and other organizations like them, are certainly both worthy recipients and usually easy to find and work with, they are not the only choices. Often there are strictly local groups or organizations that are not as well-known, or don't have the visibility of larger groups. Yet they, too, often need and can make great use of donated items, even appliances. In addition, there are schools, churches, group homes and women's shelters to consider. Oftentimes, the smaller the group, the larger the impact and perceived value of your donation. And, lastly, don't overlook friends, family and people in your neighborhood. Sometimes, recycling your old appliance can make more sense than donation, even if the unit is still working. Maybe it's really energy inefficient, or perhaps it's close to breaking down. In those instances, recycling is the option of choice. One thing that doesn't change with this option is logistics. Moving and lifting a washer or dryer takes a lot of hard work. Transporting an appliance requires a vehicle that can handle the item safely. There are some appliances, such as air conditioners, that contain some form of cooling refrigerant. Consequently, these appliances require special consideration with disposal. And, since there are federal or state regulations for the disposal of these types of appliances, before you dispose of them in a landfill, recycle or trash bin, you should call your local waste management agency to find out if they needs to be prepared before they can be discarded. In some locations air conditioners, for example, need to be taken to a specific disposal area, or require a qualified technician to remove the coolant, similar to what is done with disposal of refrigerators and freezers. The good news here is that professional junk removal teams like those at Junk King are not just well trained for these tasks, they also have the right equipment to do it fast and efficient. The first step in appliance recycling is the dismantling the unit in order to remove the hazardous components and separate the reusable parts. Recycling saves metal, plastic, and glass from ending up in the dump, and alleviates the need for extracting or producing these materials again. Responsible appliance disposal also helps to prevent the release of PCBs (polychlorinated biphenyl), mercury, and used oil into the environment. Preventing refrigerants and insulating foams from emitting ozone depleting substances and greenhouse gases is a significant benefit to the environment. But “going green” also means we donate, repurpose, and reuse everything from clothing, toys, baby cribs and strollers to office furniture and supplies. We run many of our trucks run on bio diesel, a domestically produced fuel made from more environmentally safe non-petroleum, renewable resources. Junk King is committed to continuing to lead the way to help keep our planet clean, green and beautiful for the generations to come. Ready to remove those old appliances? It’s as simple as 1, 2, 3. You make an appointment by booking online above or by calling 1.888.888.JUNK (5865). Our professional and insured junk removal team will show up at your home or office. We call 15 minutes before we arrive on site and we’ll give you a free estimate based on how much room your junk takes up in our truck, with no hidden fees.